Apricot Filling is great with vanilla and chocolate cakes and cupcakes. You will receive rave reviews when you layer your cakes with this tangy, tasty, fruit filling. I always thought that this fruity filling was best served with vanilla or white chocolate cupcakes, however, after using it as a filling with chocolate cupcakes I had everyone asking for more. The combination of chocolate and apricot is fantastic and one that I will make again very, very soon. 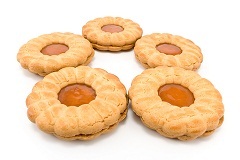 I have included two recipes for apricot fillings. I love using fresh apricots but as they are not always available I have also included a recipe which uses dried apricots. They are both very tasty and it is difficult to tell the difference in the finished filling. This filling is suitable for cakes, cupcakes, cookies, pastries and can also be mixed with cake crumbs to make cake pops. Place apricots and water in a small saucepan and allow to stand, covered, for two hours. Gently simmer for 20 minutes or until apricots are soft. Puree apricots and remaining liquid in a food processor. Add lemon juice and sugar and blend until well combined. Wash the apricots and remove stones. Put apricots, water and lemon juice into a saucepan and slowly bring to the boil. Simmer until fruit is tender (approx 15-20 minutes). Add sugar and boil rapidly for about 15 minutes. If you want the cupcake filling to be smooth it can be pureed to reach the desired consistency.